The report of the Kainthla Commission is being seen here as yet another step of vendetta of the BJP-HVC combine government against the CLP leader and former Chief Minister, Mr Virbhadra Singh. Mrs Vidya Stokes presiding over a meeting of the district Congress committee, Shimla (rural), on Wednesday. Also seen in the picture are Thakur Ram Lal and Mr J. B. L. Khachi. The Minister for Excise, Taxation and Sports, Mr Praveen Sharma, today demanded the resignation of the CLP Leader, Mr Virbhadra Singh, and five other party MLAs, who had been indicted by the Kainthla Commission, constituted to enquire into the lawlessness at the time of the formation of the government in March, 1998. Mr Prem Kumar Dhumal, has called upon the rural women to come forward and form cooperative societies for starting cottage industries to improve their economic status in society. Speaking at the golden jubilee function of HIMFED here yesterday, he said women should take advantage of the various schemes initiated by the government to make them self-reliant. The Himachal Pradesh State Electricity Board (HPSEB) has decided to set up monitoring committees with the involvement of consumers to check pilferage of power. Residents of the town will now get a telephone connection on demand as the entire waiting list has been cleared. The consolidated waiting list of 130 exchanges in rural areas has been cleared in a phased manner. As the ITBP forces are shifted to the western border form Chamba, locals feel vulnerable owing to terrorists. Snow continues to elude ski lovers for the second year in the Manali region. the Solang valley, 13 km from here, offers one of the most spectacular ski slopes in the western Himalayas. But this year the slopes are presenting a deserted look. This year Manali and its surrounding areas experienced the first snowfall on December 15. The State Electricity Board Employees Union will oppose any move to downgrade the pay scales of the Himachal State Electricity Board to restore parity with their counterparts in Punjab. The BJP has taken serious note of revolt by workers in a district and authorised the state party president, Mr Jaikrishan Sharma, for action against those indulging in indiscipline. Kainthla report vendetta against Virbhadra? 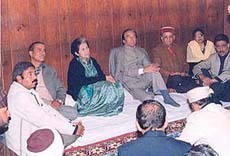 Although five other MLAs of the Congress have been indicted by the commission for lawlessness here on March 5 and 6, 1998, but the general feeling here is that the exercise was targeted towards Mr Virbhadra Singh as the assembly elections are approaching. It is being alleged that the report was a political document and was based only on affidavits of various BJP leaders, whereas Congress leaders had also filed affidavits denying their hand in these incidents. However, the two warring factions of the Congress have joined hands on the issue. On the other hand, the chief minister told reporters here today that cases would be registered and further action would be taken at an appropriate time against those found guilty by the commission. He said Mr Virbhadra Singh was free to file a contempt petition. Mr Dhumal said it was improper to suspect the intentions of Mr H.D. Kainthla, a retired sessions judge and who heads the one-member commission. He said in case Mr Virbhadra Singh did not have faith in him then why were three lawyers sent to the commission to plead for the Congress leaders. He said the high court had rejected their petition against the constitution of the commission and the Supreme Court did not grant stay on the matter. The PCC president, Ms Vidya Stokes, said the manner in which the report was released in a hurry indicated that the BJP government was feeling insecure and had done this in panic. It is being pointed out that while the commission has exonerated the police officers who were present on the spot and did not perform their official duty, Mr Virbhadra Singh and the MLAs have been hauled up. But it is worth mentioning that the government has not accepted the commission’s exoneration of the policemen and has set up a high-level committee to study their lapses and suggest further action. Initially the state government had ordered the then Divisional Commissioner, Mr Deepak Sanan, to enquire into these incidents, but after sometime he suggested that it should be assigned to some judicial commission. The commission in its report has referred to Mr Sukh Ram having emerged as the king maker who dictated his terms to the BJP in the given situation when the party came to power. Meanwhile, the state unit of the BJP has urged the government to take immediate action against Mr Virbhadra Singh, and other Congress leaders indicted by the Kainthla Commission. Talking to mediapersons here yesterday, he said Mr Virbhadra Singh, who had been held responsible for the incidents, along with the other Congress MLAs must resign on moral grounds. “It is most unfortunate that Mr Virbhadra Singh tried to create a regional divide between the people of upper and lower Himachal merely to capture power,” he said. He added that the inquiry report had made it clear that not only the Congress legislators, but party workers had acted in a most irresponsible manner by kidnapping Independent MLA from Jwalamukhi, Mr Ramesh Chaudhary, for the formation of a Congress government in the state. Mr Jaikishan Sharma, president of the state BJP informed that a meeting of the state BJP executive and office-bearers would be held at Bilaspur on January 19 and 20 which would also be attended by Mr Shanta Kumar, Mr Dhumal and Mr O.P. Kohli, party in charge for Himachal. Mr Prem Kumar Dhumal, has called upon the rural women to come forward and form cooperative societies for starting cottage industries to improve their economic status in society. Speaking at the golden jubilee function of HIMFED here yesterday, he said women should take advantage of the various schemes initiated by the government to make them self-reliant. This would not only enhance their income but also ensure the best use of the available raw material. He said the Department of Horticulture would consider providing the rural women entrepreneurs with the technical know-how and assist them in marketing their products to fetch remunerative prices. Mr Dhumal said the state government was planning to get the soil tested so that they could grow those crops which suited their land. Mr Rikhi Ram Kaundal, Minister of state for Cooperation, said the State had received financial assistance of Rs 68 crore from the Centre during the past four years as compared to Rs 35 crore provided during the past 12 years. He said various projects were being executed in Kulu, Chamba, Solan, Una and Mandi districts. He advised the cooperatives and federation people to ensure the recovery of loans provided by the government. He said the formulation of service rules for the benefit of cooperative secretaries had yielded good results. The decision was taken on the recommendations of a brainstorming session, presided over by Mr Shamsher Singh, Chairman of the board, here yesterday to finalise the action programme in line with an MoU signed by the state with the Centre. The state load despatch centre, here, and its sub-centres at Hamirpur and Kunihar will be commissioned shortly to strengthen interconnections and effect better transmission of power to grid stations for distribution. In another important decision to help avoid time and cost overruns in the execution of hydel power projects single line administration under an authority with specific responsibilities was proposed to be adopted. Disclosing this, the General Manager, BSNL, Mr Pradeep Kumar, said at a press conference here today that the waiting list of urban areas, other than Mandi, was 498 which was likely to be cleared during the current financial years. He said the equipped capacity of the district was 66,350 lines of which 44,264 lines were functional in rural areas. Of the total 2,740 villages, telephone network had been provided in 1,857 villages. The remaining villages would soon be provided with telephone connections, he said. The mobile telephone facility of the BSNL was likely to be made available in another five or six months along with other parts of the northern region. He said the target of providing 10,000 new lines was likely to be achieved by March 2002. Snow continues to elude ski lovers for the second year in the Manali region. the Solang valley, 13 km from here, offers one of the most spectacular ski slopes in the western Himalayas. But this year the slopes are presenting a deserted look. 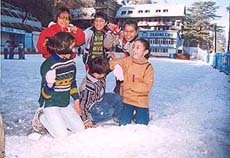 This year Manali and its surrounding areas experienced the first snowfall on December 15. And the Solang ski slopes had only about 2 feet snow and due to the rise in the atmospheric temperature, the snow melted after two weeks. The Directorate of Mountaineering and Allied Sports, Manali, which used to conduct ski courses every year, had to postpone these till fresh snowfall. It had organised a special skiing course from December 27 to January 9. Mr Chander Singh Mandyal, general secretary of the union, expressed anguish and surprise over the re-opening of the issue and said the pay scales of any category could not be downgraded after a lapse of 32 years. He said since 1968 the pay scales had been revised four times and the board employees were in receipt of pay scales on the basis of accepted principle of “scale-to-scale revision” under negotiated settlement. He said the fact was that the employees had been denied promotions and benefits such as selection grade on the Punjab pattern. The BJP has taken serious note of revolt by workers in a district and authorised the state party president, Mr Jaikrishan Sharma, for action against those indulging in indiscipline. The state office-bearers who met here yesterday under the chairmanship of Mr Suresh Bhardwah, vice-president, urged partymen not to take internal matters to the Press and raise these at party forum. The infighting was tarnishing the image of the party, he added. It was decided that a two-day meeting of the state executive committee would be held at Bilaspur on January 19 to 20.